I came late to this amusing and informative book, I’m sorry to say. It’s an amazingly detailed compilation and exploration of what the French would call curiosités or choses insolites but it’s also a broad cultural overview. It’s an example of the best of a certain type of book designed to explain France to English-speakers. Between A and Z you will learn there are more than twenty-five varieties of garlic grown in France, and that the guillotine was designed by a doctor shortly before the French Revolution as a more humane means of execution. Attaching his name to it horrified him, and his family rechristened itself to escape the shame. On the way to Zinedine Zidane you will make obligatory stops at Mata Hari, the legendary Dutch dancer executed as a spy (she was really a double agent) near the end of World War I, and a longish section on the history of restaurants, before ending with the entry for Zidane, the former soccer star. He used to be best known for the infamous headbutt during the 2006 World Cup final (which I saw on TV in Paris and will always remember), but he’s since become a respected soccer coach for Real Madrid. 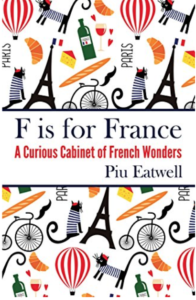 Piu Eatwell is an Oxford graduate now living and writing in Paris, according to her website. She’s written several other books I was aware of but have not reviewed, including They Eat Horses, Don’t They, The Truth About the French, a well reviewed outline of the stories behind the myths Anglophones believe about the French. I found all of them on her list at Amazon. F is for France was mismarketed, in my view. It should have been sold as a book of much broader general interest, like David Downie’s work, instead of a cabinet of curiosities. But I’m glad I came across it again. For a lover of France and Paris it is both an entertainment and a reference work. It will stay in my library. My first exposure to F is for France was an advance reader copy I downloaded from Netgalley in 2016 and promptly forgot. When I ran across it again (while I was preparing Netgalley to support the publication of my next novel in a few months), I bought the Kindle version, which is the edition on which this review is based.